I have searched, but haven't found an answer to this, probably because it is not of greatest concern. However! In what time period would you say that Dominion is set? Obviously it is a time at least a few centuries ago, but I am curious as to when? Re: Time Setting of Dominion? Theme in Dominion is a tricky subject. While the game has a vague medieval theme, it is very much secondary to the mechanics. To give you an idea, read the Secret History of Dominion article; the game evolved from a dungeon crawler (your deck was a hero who "leveled up" by gaining cards) and seems to have gone through at least one phase as a castle-building simulator (the card "Farmland" from the Hinterlands expansion was originally called "New Wing"). In many cases the cards have changed names several times, and of course the art is done by various artists, none of whom is Donald X., the game designer. To get an idea of how much difference this makes, look at the pictures of the various Knights from the Dark Ages expansion; trying to come up with a consistent date based on the designs of the various suits of armor is not going to work, and these are all closely related cards! So trying to narrow it down to a specific time period (e.g. 1483 or even the 15th century) is probably an exercise in futility. Some cards evoke a feeling of the Dark Ages (such as...many of the cards in the Dark Ages expansion) while other cards have more of a Renaissance feel to them. Individual cards have thematic elements (e.g. you "donate" extra cards to the chapel, the witch gives curses, etc.) and related cards tend to have related names (Witch, Sea Hag, and Soothsayer all give out curses, for instance), but the card interactions are frequently not particularly thematic (how do you remodel a Moat into a Remodel? what does that even mean). To the extent cards are linked by theme, it makes sense to look more at the cards in the same expansion; Seaside tends to have more cards dealing with the Sea and Exploration, while Guilds tends to have more cards representing skilled craftsmen and "guilds" (duh). Long story short, you can assign your expansion to whatever time period works for you. Dominion is much more of a functionalist sort of game; if a card doesn't work, don't make it, no matter how thematic it is. Functionality has been the most important thing for Donald X., but that doesn't mean it necessarily has to be the most important thing for you. It's totally fine to focus on the theme, if you want to. Isn't that a bit like reading certain magazines for the articles. 'certain magazines'? Can't we just say 'Bridal Magazines', man? I subscribe to Scientific American, but only for the pictures. I know, right? Did you see the pictures of those twin stars? They were just massive. EDIT: also something about a black hole. That joke is left as an exercise to the reader. I'd say the Dominion covers the Middle Ages, let's say the High and Late, and a bit of the Renaissance. The discovery of America by Columbus in 1492 was right at the end of the Middle Ages and ushered in a new age of exploration, as seen in Seaside in cards like Explorer and Navigator. Marco Polo travelled the Silk Road in the thirteenth century and we get some Hinterlands cards from his travels, Mandarin and, of course, Silk Road. I'd say it goes even earlier than that as well. Dark Ages, in particular, has several cards that are intentionally evocative of the "Dark Ages" (i.e. Early Middle Ages). Marauder, for instance, is clearly inspired by the Vikings, or even the Migration Period. So say, 750-1550 as your time period. That's long enough that I'd put it as "vaguely Medieval," especially when you include intentionally fantasy elements like Sea Hags, Familiars and the like. But of course, if you're making a fan expansion for your friends, you can do whatever time period best suits you. The Roman Empire, for instance, would have several interesting options for card names. Likewise with a focus on the Reformation period, or the Mongols. You could expand the geographic area as well; cards like Mandarin already do this to some extent, but a fan expansion could easily focus on e.g. Persia or Sengoku Japan. You could even do something totally made up, although your friends might look at you strangely when you try to sell them on Lord of the Rings or Star Wars-themed Dominion expansions. Yeah, my original thought was to make cards that benefit each of the five core 'strategies' in Dominion: Engine, Big Money, Combo, Rush, and Slog. Each card type you have a different themed race that was vaguely reminiscent of that type of card. One of my first thoughts was "Oh! Ancient Greeks! They were smart! They should be the race for the Engine themed cards!" However then I realised I might be a few hundred years off... In the end I guess it doesn't really matter too much, hey I might still end up using the Greeks (or people who resemble them closely in look, but aren't strictly named "greek" o the card). I could possibly be mixing these time periods up, but there is my stab at it! The theme is pretty important to me. Donald has talked about enjoying 1920s gangster themes, and I highly doubt that I would have become a fan of Dominion if he'd chosen that theme. Similarly, I just can't get into sci-fi. Or at least, it is significantly less appealing to me. Even though I don't care about theme, an annoying theme could turn me off. Like, say, Ascension, where the cards all have multi-word names like Ascetic of the Lidless Eye and such. Give me Dominion's mostly one word names any day. 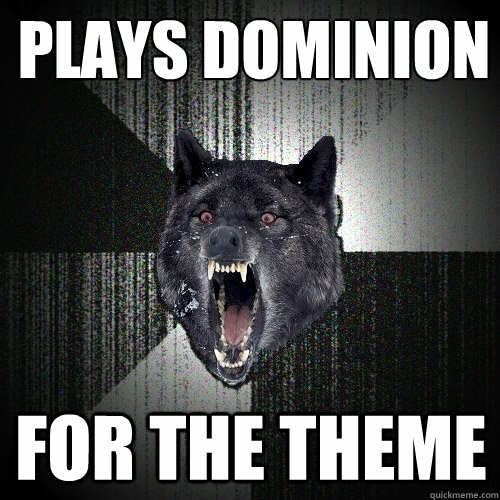 I've heard Dominion described as having a Shakespearean theme and I like that. That doesn't mean it's trying to emulate the works of Shakespeare as if it had some kind of Shakespeare license. Rather that it shares many of the same time periods and archetypes, and it's much more concerned with combining elements amusingly versus realism and historical accuracy. I guess you could say the play's the thing.